It may be the case that targeting your actions to individuals outside our built-in legislative data set makes the most sense. In that case, you can create custom targets for your actions-- both campaign type actions and letter to the editor pages. Custom recipients can be created one by one, or imported as a group (using the same import interface as you're familiar with from supporter uploads). You can email or fax these recipients. Custom recipients are not the same thing as supporter records- you will not be able to target your recipients through email blasts. You will be able to target custom recipients through Campaigns and LTEs. Please note: there is a maximum of 90 custom targets in any action you set up. If you have more than 90 custom targets, you may want to consider segmenting your action (and any email blast associated with it). To get started with a single custom recipient, click the "Create Recipients" link in the target recipients menu, under the Advocacy tab. 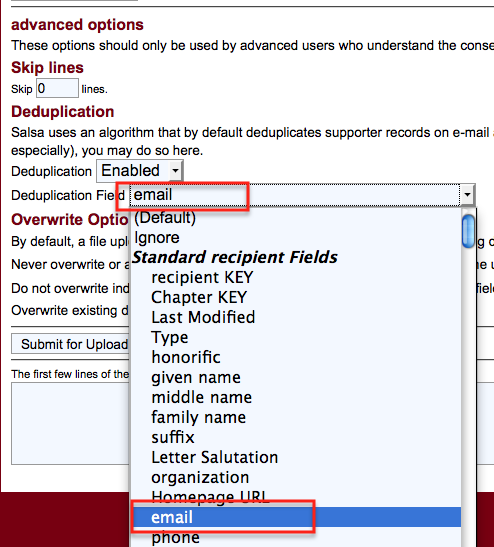 For a single recipient, there are a number of fields you'll need to fill out, which appear below. These are the same fields you'd create in a mass upload of recipients, so you can use this list to check any upload you're building as well. Watch this training video or read the instructions below. This is the target recipient's first name. This is the last name for the recipient. This is the name of the organization that the recipient represents. This is the email of the target recipient. This is the fax number of the target recipient. Fax numbers for international destinations should likewise be an uninterrupted numeric string, beginning beginning with the country code number (e.g., 44 for the U.K.). The recipient's primary physical address. The recipient's city as related to the primary physical address. The recipient's state as related to the primary physical address. The recipient's postal code as related to the primary physical address. The recipient's country as related to the primary physical address. If you have a picture of your recipient, enter the hosted URL here. Is there a custom greeting this person expects? "Dear Your Highness," etc. Choose between several contact methods, to pick the one that represents how best to contact the recipient. Selecting Email or Fax will override the Action's settings and always send this type of message when this recipient is targeted. Here, you can select various states that the recipient should only receive messages from. Enter zip codes in comma separated format (five digit zips only) if you wish the recipient to only receive messages from people in these zip codes. Check these boxes if you would like this supporter information to be hidden from the target. This page lists all the custom target recipients you have created. Here, you can sort and filter a variety of ways. 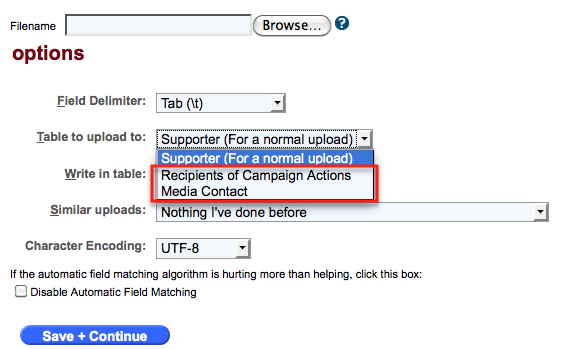 The recipient upload process matches the supporter upload process in almost every way, except for the table to which you'll upload. You can access the import interface from either the Manage Imports dropdown in the Supporter Management package, or from the Target Recipients dropdown in the Advocacy Campaigns package. Taking a step back - to create the spreadsheet of your custom recipients, you can use as few or as many of the fields below as your column headings (or simply download this tab-delimited template which includes all of the fields below). Just remember to not leave out any contact information if you actually want to send letters to those targets! Once the upload has finished (hit refresh after a few minutes), you will then be able to select that custom target in your Action orLetter to the Editor pages. For more information on how to use the uploader, try taking a look at the guide to Manage Imports. Here you can group your custom recipients. Create a group by naming it and saving it (towards the bottom of the page). Then select the target recipients you want in that group. For example, you might call a group "Montana Roadless Campaign" and put various Forest Service decision makers in that group. How can I bulk delete target recipients that I just uploaded? A bulk delete would have to be executed on the backend by Salsa staff. Please contact Salsa Support (Support@Salsalabs.com) with your request. I need to restrict who contacts the target by city. We have a transit board with many member cities and I need for residence of a city to target their members. The zip code function won't work because almost all of the zip codes in the area are shared between cities. How do I set this up? Unfortunately you can't do city-based targeting with your custom recipients. Instead, I would recommend being very specific in the Targeting portion of your email blast, to reduce the number of people outside the constituencies taking action. Certainly, you still might get some action takers who were forwarded the email, but it will help reduce the chances. You could also set the "Targeting Method" on the Targets tab of your action to "black hole" - this will prevent any letters from being sent, but they will be collected in Salsa. You could then filter those letters and send them off manually. Is it possible to allow supporters to chooose which of the eligible targets their message goes to? For example, some supporters may want to direct their email to only one of their senators or to one senator and their member of congress. This seems like it would be a useful feature, especially when using custom recipients, as it allows us to put more power in the hands of our supporters to tailor their message as they see fit. After making this change, the user will be presented with a list of recipients to target based on their entered zip code. Does Salsa have any kind of interface with Regulations.gov to allow for automatic comment submissions on proposed rules? That's a really great idea and something we would love to do. However, the way those pages are set up prohibits Salsa from interfacing correctly with their webforms. Each regulation listed on that site has a completely unique, separate webform for comment submission. That means that for every new comment form/regulation that goes up, Salsa would have to create a brand new interface, which is quite time consuming. We'll continue to monitor the underlying technologies on Regulations.gov, and if the opportunity comes up to make Salsa compatible across the entirety of Regulations.gov, we'll jump on it! Once I upload the custom target's picture to Salsa and enter the image address information, when an email is sent does the picture display as it would after a email/webform has been submitted by a user? Thanks. If you add an image to a custom target it does display (along with other target information) on the targeted action's page as shown below. Is there a way to assign custom recipients/targets to custom recipient groups? For example, I want to upload city councilmembers of five different cities into five different custom recipient groups, named City_A, City_B, etc. I've created those groups and included them in the tab-delimited text file for import, but I can't figure out how to match them.